Mikio Naruse was a Japanese filmmaker, screenwriter, and producer who directed some 89 films spanning the period 1930 (towards the end of the silent period in Japan) to 1967. Naruse is known for imbuing his films with a bleak and pessimistic outlook. He made primarily shomin-geki (working-class drama) films with female protagonists, portrayed by actresses such as Hideko Takamine, Kinuyo Tanaka, and Setsuko Hara. Because of his focus on family drama and the intersection of traditional and modern Japanese culture, his films are frequently compared with the works of Yasujirō Ozu. 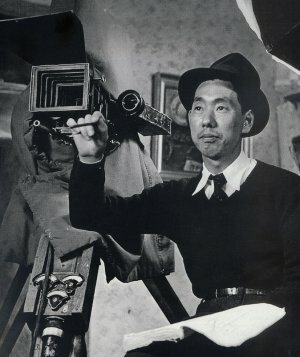 His reputation is just behind Akira Kurosawa, Kenji Mizoguchi, and Ozu in Japan and internationally; his work remains less well known outside Japan than theirs. Among Naruse's most revered films are Late Chrysanthemums (1954), Floating Clouds (1955), and When a Woman Ascends the Stairs (1960). Akira Kurosawa called Naruse's style of melodrama, "like a great river with a calm surface and a raging current in its depths".